This book tells the true life story of Donald B. Young Jr's adventures within nature's wild, realms in the spirit world, and of mysterious unknown cryptids among forest or mind. Many of the ghosts, spirits or cryptids Don has encountered during a lifetime still haunts his memories. 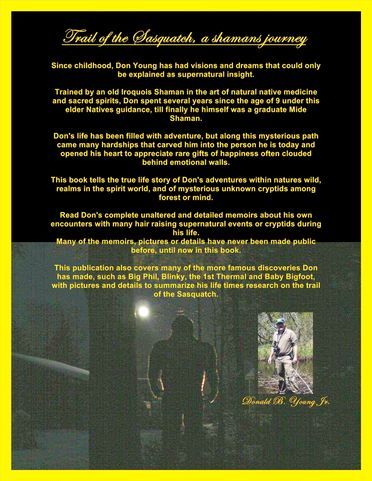 Read Don's complete unaltered and detailed memoirs about his own encounters with many hair-raising supernatural events or cryptids during his life. 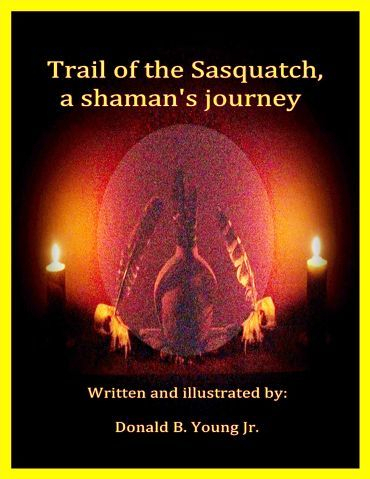 The publication also covers those more famous discoveries Don has made, such as Big Phil, Blinky, the 1st Thermal, Baby Bigfoot, and the burial ground, with pictures and details to summarize his lifetime's research on the trail of the Sasquatch. This book has been rated 5 stars, and reviewers state it rises above all other books in its subject, with heart pounding adventures that continue to keep the reader interested page after page. A lifetimes worth of adventures put into over 30 chapters with dozens of photographs taken afield. A story of a man's love, hate, loss, hardships, success, failures, and adventures from childhood to present. His Native American teachings of healing, rituals of spiritual contact or dreams and visions that staggers the mind.